Golfing Record allows you to record your golf scores, analyse your performance, and maintain a centrally calculated handicap. 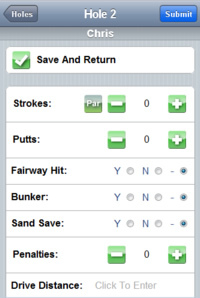 Full iPhone and Android support - track your groups' stats and Stableford scores hole by hole on your mobile. Just choose a user name and password and start tracking your golf game today! One payment of $15.95 gets you VIP membership. No recurring subscriptions, no catches, just full, unrestricted access to all current and future features of Golfing Record. Enter scores on your iPhone or Android device. Manage multiple players and create new courses as you play. Click here for more details. "The society that we run is now using this as our way of ensuring we all play off a handicap using the same methods... it's fair, personal, easy to use, and is interesting to see how each game looks on paper. Fantastic site, long may it exist!" "My wife and I were searching for a good score/handicap tracker a few days ago. After trying a few not-so-great websites, we searched for 'online group golf score tracker' at Google. There it was, your website was found. We are very glad to have done that last search. My golfer friends are coming on board now." "Word of mouth is how I found out about this brilliant site. I have continued to spread the word as a result. I am very new to the game but am getting pleasure from trying to improve where ever I can." "Top site!! nice and easy to use, most members of our society are on board."